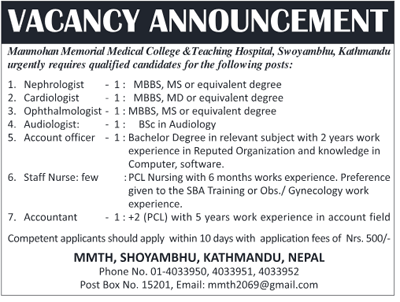 Manmoham Memorial Medical College announces vacancy for the post ofNephrologist, Cardiologist, Ophthalmologist, Audiologist, Accountant, Staff Nurse. Qualified and interested candidates can apply for the post. Submit Your cv along with cover letter to the Manmoham Memorial Medical College, Swoyambhu within 10 days with Nrs 500 as a Application fee.